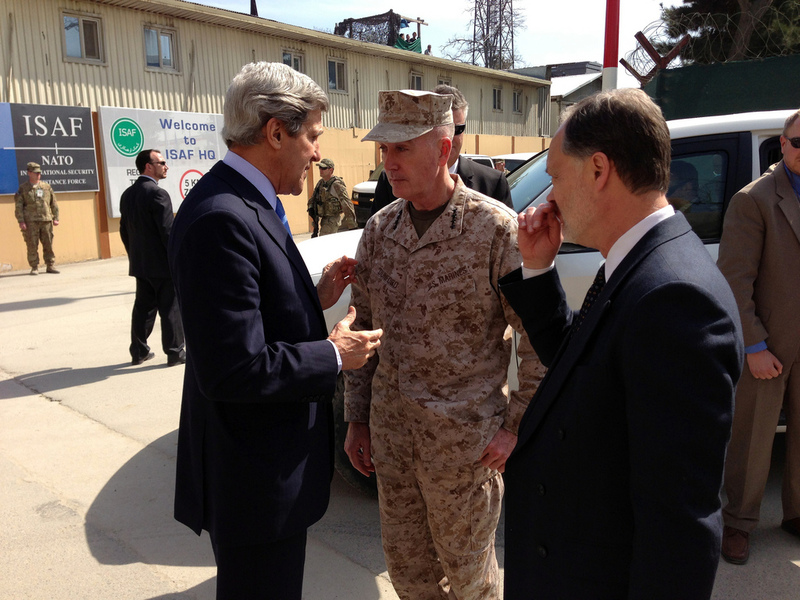 U.S. Secretary of State John Kerry speaks with U.S. Marine Corps General Joseph Dunford, as U.S. Ambassador to Afghanistan James Cunningham listens, in Kabul, Afghanistan, March 26, 2013. Ambassador Cunningham issued the new U.S. Civil-Military Strategic Framework for Afghanistan in August which was signed by General Dunford. Photo via State Department. Afghan President Hamid Karzai’s recent refusal to sign a bilateral security agreement with the U.S. has fueled a growing sense of frustration and confusion among those charting the future of Afghanistan. The agreement, which authorizes the continued presence of American troops in Afghanistan beyond 2014, has been described as “critical to Afghanistan’s future stability.” One unnamed Afghan official quoted in a recent report from NBC News said that without the thousands of U.S. troops that are expected to maintain a presence in the country “the government could collapse and Afghanistan would enter a civil war.” Former Ambassador to Afghanistan Ryan Crocker told Foreign Policy that he worries about a lack of “sustained administration engagement at a high level,” which has the potential to set the stage for a repeat of “pretty horrible” past events, referring to the civil war in the early 1990s that led to the Taliban’s rise to power. While Karzai has signaled that he will likely sign the agreement, stating earlier this month that he wants to wait until after the April 2014 presidential elections, he continues to find new reasons for failing to do so, including most recently disagreeing with the U.S. government’s definition of terrorism. Assuming the agreement is eventually signed, what does the future actually hold for the Afghan people? Public Intelligence has obtained the most recent version of the U.S. Civil-Military Strategic Framework for Afghanistan, the second revision of the document dated August 2013, detailing the U.S. government’s goals and priorities for rebuilding Afghan society. Issued by the U.S. Ambassador to Afghanistan James Cunningham and signed by the commander of U.S. forces Joseph Dunford, the framework covers U.S. priorities related to governance, the rule of law, socioeconomic development as well as the gradual transfer of authority to the Afghan government. When compared with a previous version of the framework from March 2012, also obtained by Public Intelligence, the document solidifies the prospect of long-term U.S. involvement in Afghanistan, removing optimistic statements about turnover dates and self-sustaining funding estimates and replacing them with measured assessments reinforcing the notion that U.S. and international forces will be present in Afghanistan far into the next decade. Despite its optimism, the framework is remarkably frank about its diminishing expectations for Afghanistan, noting that even with “a strong partnership between the U.S. and Afghanistan, the Transformation Decade will be fraught with challenges” requiring “constant evaluation.” Even under “the best of circumstances,” the framework says “Afghanistan will continue to be in the category of ‘least developed nations’ with high levels of poverty, unemployment, and illiteracy, as well as underdeveloped infrastructure.” Moreover, the nation will continue to be threatened by “non-state actors” that will decrease stability and challenge the Afghan government’s capacity to govern. The viability of this transition remains to be seen as U.S. troops have previously voiced concerns about the readiness of Afghan forces. A 2012 survey of several U.S. Army companies stationed in Khost and Paktiya provinces found that nearly half of soldiers surveyed said the Afghan National Army (ANA) had improved little, not much or not at all during their partnership. Many soldiers cited in the report list Afghan forces’ lack of motivation and rampant illiteracy as factors undermining their training efforts. Nearly 62% of soldiers responding to the survey said that so-called “ANA-led” missions are rarely or never actually planned and executed by Afghan forces. One soldier quoted in the survey described how a recent “ANA-led” mission required him to “spoon-feed” his Afghan counterpart the entire operations order and planning. “We do the heavy lifting, they put a face on it,” another soldier said. 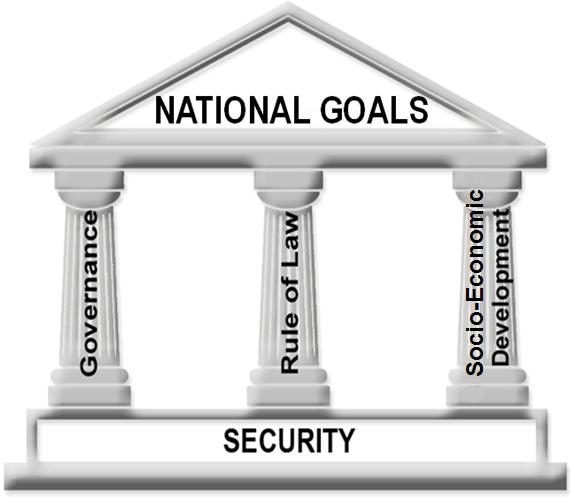 A graphic depicting the theoretical structure of the U.S. Civil-Military Strategic Framework for Afghanistan.